The Slimming World Files: Weigh In and Wow Moments. Tuesday started reasonably early for me, at about 4pm as I woke up before Hague was back from work, although I hadn't made it downstairs and so he brought up the plethora of parcels that had been delivered for me! So exciting! In with the more mundane deliveries of some daisy appliques and a sticky thingum for my phone was the beautiful skirt I'd ordered from Vivien of Holloway. It was in the sale, and I had ordered the biggest size, which was a 34" waist/46" hip. Last time I'd measured my waist it was around 36" so I was fully expecting to have to wait a little while to slim into it, and when I unwrapped it I was sure it wouldn't fit. Hague, however, encouraged me to give it a go and so I tried it on.......and it fitted! It actually fitted! I was over the moon, a huge, huge non-scale victory for me there. With such excitement behind us we headed off to weigh in. I needed 1½lbs for my next award and wasn't sure if I'd get it, but I got exactly that and so got myself this as well. 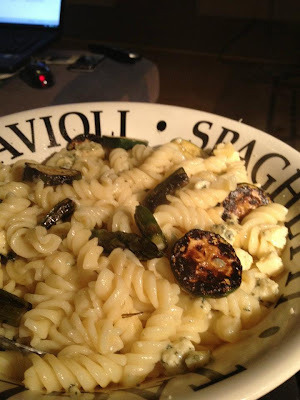 With a rather fab group over we headed home and I had to get myself fed before work, so as I wasn't sure what I fancied I went for the easy option of cheesey vegetable pasta. With no deliberate intent to reduce what I'm eating just following the plan, losing weight and obviously the natural shrinkage of my stomach has led to my portions getting smaller. My dinner yesterday filled me up just fine, so if you're worried you're eating too much, don't. Portion control will come naturally :) Anyway, enough preaching from me, as I followed up my pasta with my current favourite dessert. Mango chunks with coconut yogurt. Once more I am addicted :) With dinner eaten it was time for work once more. It wasn't a bad shift, reasonably quiet, and plenty of breaks! My lunch was some of the leftover frittata, with some beetroot salad and then yet another dessert of fruit and yogurt, this time blueberries with a lemon Activia. So delicious! It's that feeling that keeps me going! I've just finished week 3, and now I'm getting scared about week 4 - 5 mins of running!! I may die, but then I thought that about week 3.